Making Plans: Join the Planner Movement! 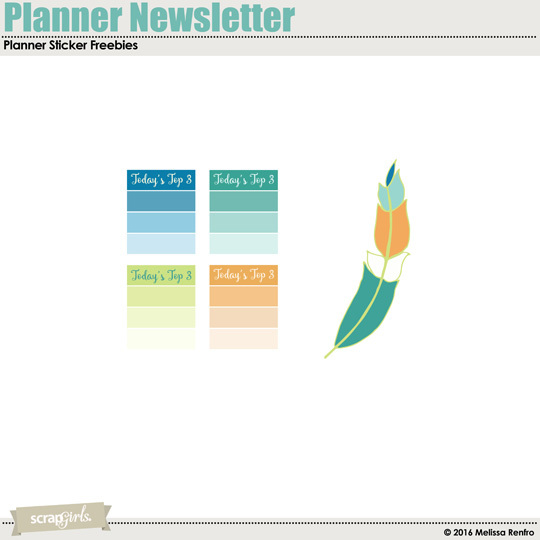 Home / All Posts / Making Plans: Join the Planner Movement! Everywhere I go these days, I see planners. It seems like the more tech we have available to us for keeping our lives in order, the more people seem to be interested in using the old-school paper method to keep track of everything. 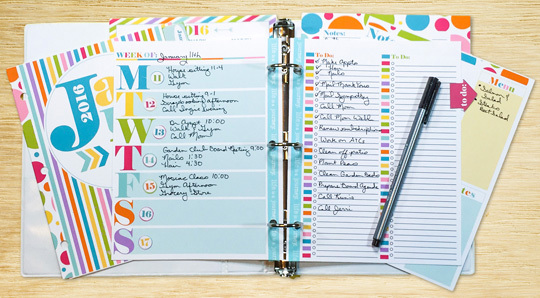 The popularity of weekly and daily organizers and schedulers has skyrocketed. 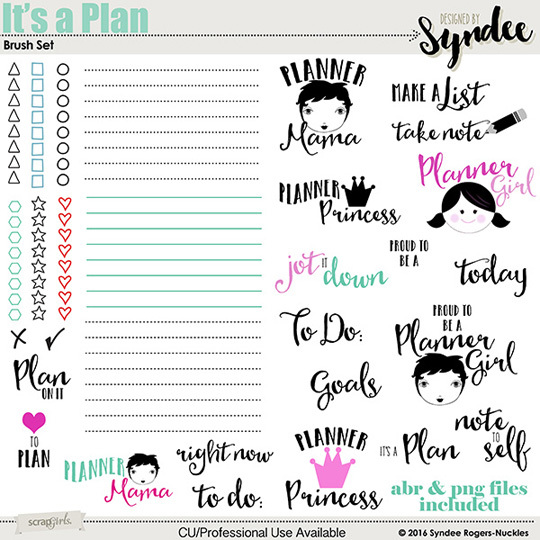 Planners have also become a new expression of style and an outlet for your creative side with the availability of special stickers, add-ons, colorful pens, and space created specifically for daily doodling. Photo Credit: Amanda Fraijo-Tobin Photo Credit: Melissa Renfro Photo Credit: Karen WebbDespite all these options, none of the preprinted paper planners give you the ability to create a custom layout where you can reorganize the page format to keep track of just what you want to keep track of, as well as add your own personal touches. 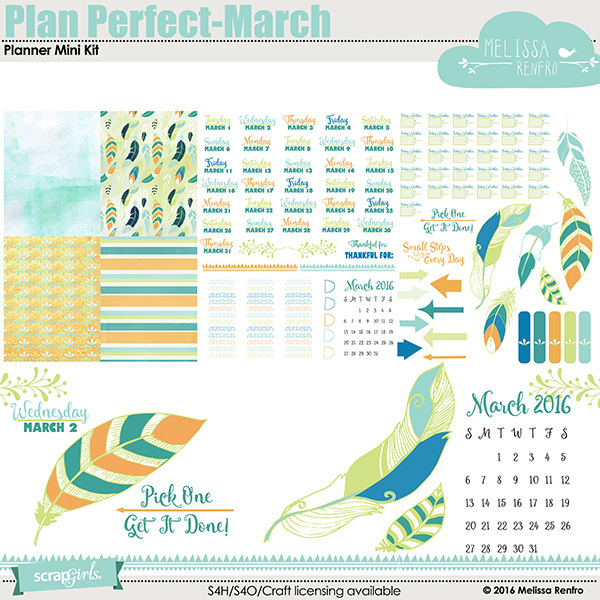 So here’s the great news – our new digital printable planner products are the answer! Some of our Designers and Creative Team are more than just a little excited about all the possibilities of combining planners and digital design, so we decided to share this excitement with you by creating a special edition of our newsletter, dedicated specifically to planners and organizers. This newsletter will be sent out periodically throughout the year. Aside from helping you wade through all of the various planner options, during the year we will also cover practical aspects like printing, binding, and effectively using your planner to keep your life in order. 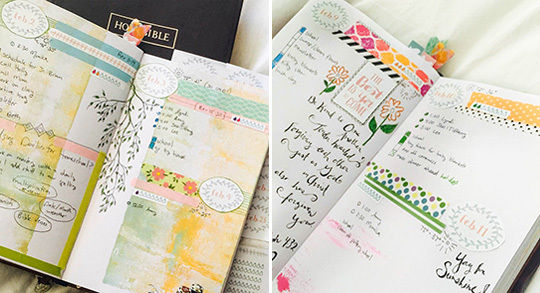 And, of course, we will be focusing on the fun part, too – how to embellish, personalize, and beautify your planner to make it your own work of art. 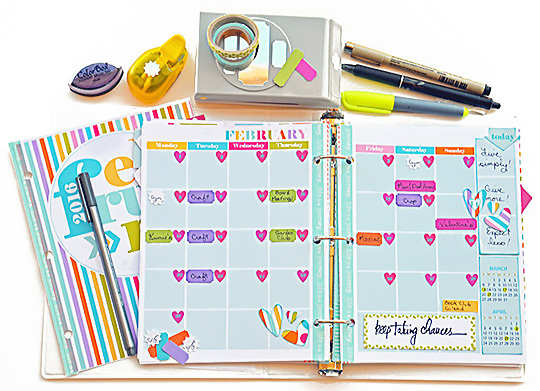 Plus, upcoming newsletters will focus not only on planners but how to create art journal planners, calendars, and more. 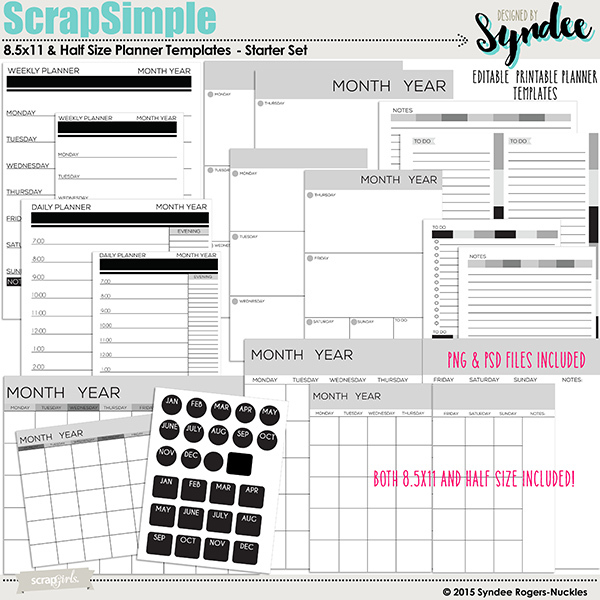 And as always, it wouldn’t be a Scrap Girls newsletter without a Freebie! So, we invite you to join us as we launch our planner-focused newsletter. You can also follow our Planner projects on Pinterest here. If this topic does not interest you, we’ve made it simple to opt out of future editions. Simply scroll to the bottom and follow the three easy steps. 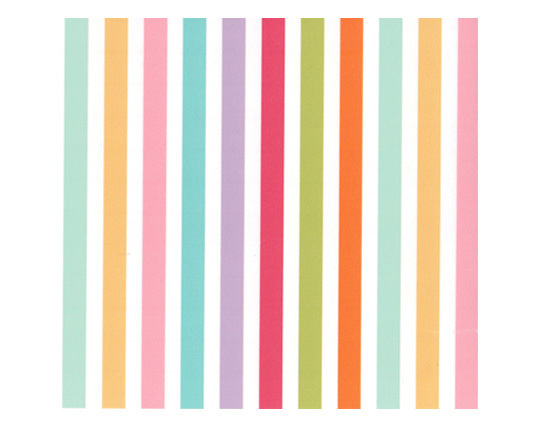 This first newsletter discusses some practical aspects – finding the right paper for your planner. 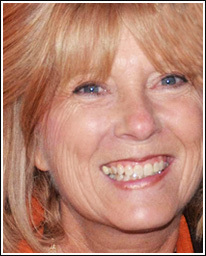 We have a special article to help you through this first crucial step. 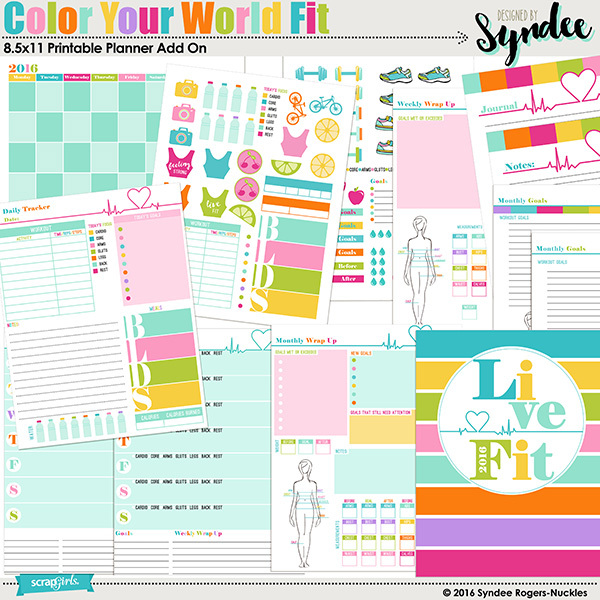 I adore Syndee’s new planner products! I was so excited that my first impulse was to just start creating and printing. However, I knew that would be a mistake because I have thrown out my share of projects because of poor paper choices. 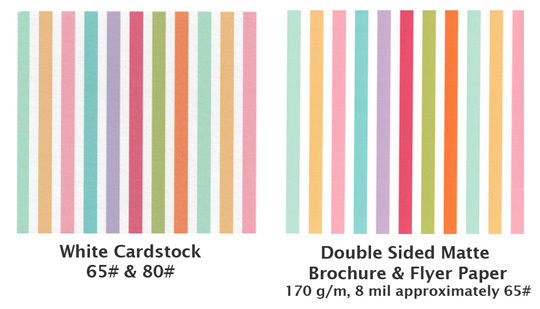 A printed planner has to measure up in a lot of ways: Paper weight, thickness, opacity, and surface properties matter. I tested a number of paper types, adjusting my printer accordingly (cardstock, photo papers, text weight copy, linen, and matte white brochure and flyer). As I suspected print quality really varied. There were differences in writing surfaces, thickness, durability, embellishment options, feel, and price. Paper opacity also varied. No one paper was perfect but the one that I found to be the best overall was (drum roll) – the matte white brochure and flyer paper (170 g/m, 8 mil) from Staples. With the exception of poor results with wide-tipped permanent markers, alcohol markers, and pencil erasures, it was perfect. I am so pleased with the custom results I achieved at home the Color Your World Printable Planner, I can’t wait to try other planner products! 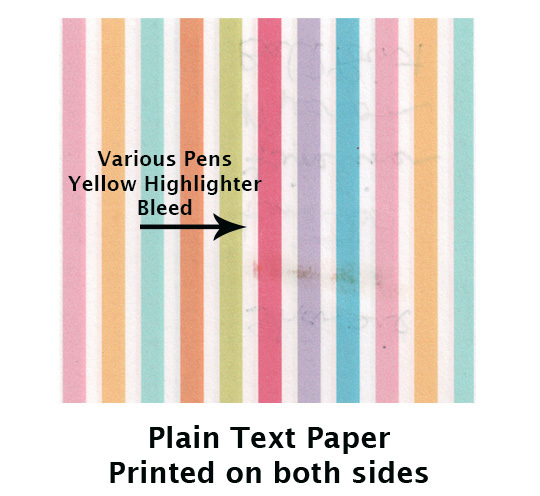 You will also find many commercial printing options available at office supply stores and online. But whether you are printing at home or commercially, decide what paper attributes are important for printing your planner. Then, organize your life in an artful way!